A storage basket is a must-have accessory for your home whether you are in need of an area to store your bathroom accessories, shoes or office stationery. 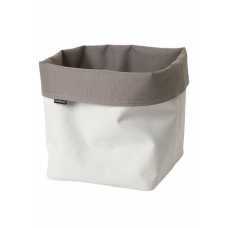 The Blomus Ara Reversible Square Storage Basket is a unique, hard-wearing synthetic basket that boasts a block sand white and anthracite black design that you can reverse to suit your personal preference/ interior decor scheme. Measuring at 26cm height, 23cm width and 23cm depth, the Ara Reversible Square Storage Basket is available in one size only. Mix and match this incredibly contemporary luxury storage basket with the brand's original rectangular Ara Reversible Storage Basket (that can be found linked below) for a coherent storage basket display. The Ara Reversible Square Storage Basket has been carefully designed and manufactured using stain-repelling synthetic fibre ensuring that the design is suitable for home and commercial bathroom spaces where water and chemicals are in abundance. The Ara Square Storage Basket has been designed to suit the incredibly sleek and stylish minimal Ara bathroom accessories that can also be found linked below. If you would like to find out more about the designers behind this piece and would like to explore the rest of their range, please visit our dedicated Blomus brand page.